Cole Anthony came into the season with a big name and bigger expectations. 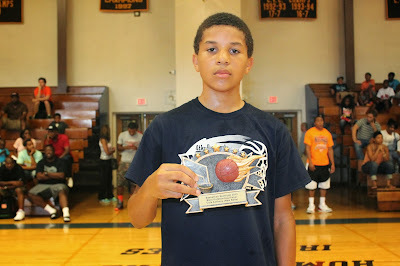 He stepped up big during the Tip Off Classic while helping the Rens advance to the final four. It seems as though defenses are having a tough time slowing down the kid from the Big Apple. Basketball seems to be second nature and he makes it look so easy that it's only right that was change his name to Cole "The Natural" Anthony. We had a chance to chat with "The Natural' and this is what he had to say. BS: What's the best moment of your young AAU career? CA: Making it to the AAU D2 National Championship Finals in 2011. We lost in the chip but I learned a lot of lessons in defeat. Plus, I had a great time with my teammates. BS: How did it feel to see yourself on the big movie screen? CA: I liked seeing myself on the big screen in Little Ballers because it was nice to see how much I've matured since that time. BS: Whats your best moment at Basketball Spotlight? CA: Beating Metro Flyers because they had beaten us the last few times we played them. BS: What was your dream college? BS: Who would you regard as the toughest player you faced? CA: It's actually two which are the Langley Twins from Carolina Preps. BS: Do you feel any pressure to succeed because you have a father that played in the NBA? CA: No because I'm my own player. BS: What's the strongest assets of your game? CA: Attacking and scoring the ball. BS: What aspect of your game needs the most improving? CA: My ball handling can be improved. BS: If you can have dinner with one person in the world, whom would it be and why? CA: President Obama because he is an inspiration to me and he is the leader of the free world - I figure there is a lot I could learn from him. BS: Tell us something about you that we don't know. CA: A lot of people don't know I have a better j than my dad. BS: Give us one word to describe Basketball Spotlight.